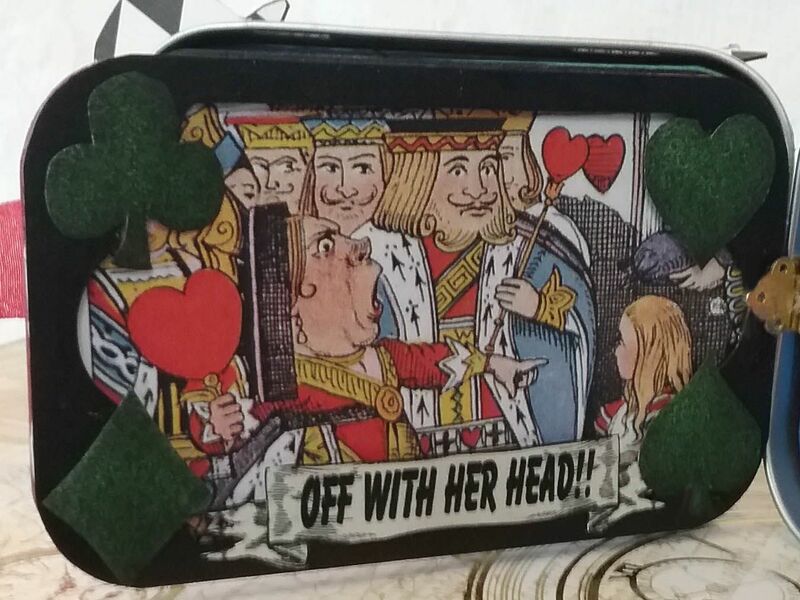 This month at Alpha Stamps it’s all about Alice and Altoids tins. 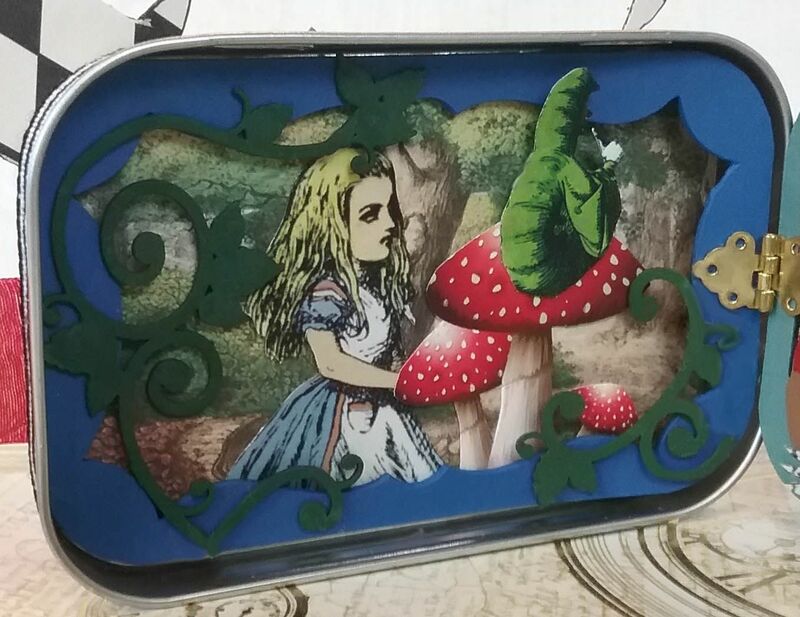 What a perfect combo as I LOVE anything Alice and altering tins. 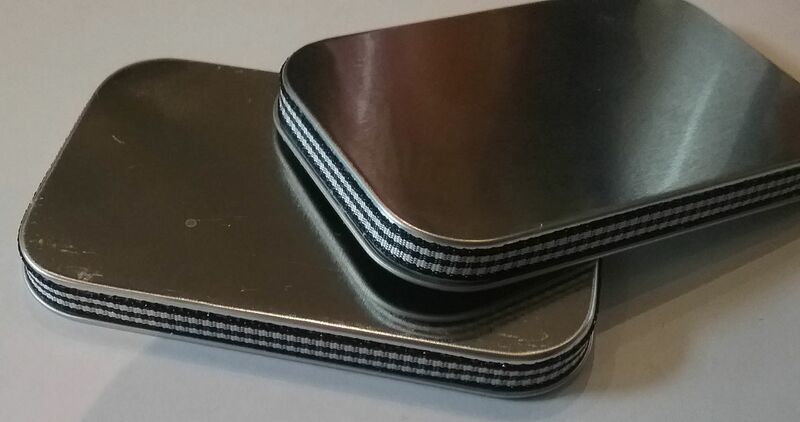 Most of my Altoids tin projects only require the container and not the lid. I end up with lots of leftover lids which I hate to throw away. To the rescue is an easy book project that uses just the lids! The two lids serve as the front and back covers for the book inside with a closure made from a ribbon attached to the lids. Inside is a book made from frame inserts (hinged together) that are sized to perfectly fit the lids. 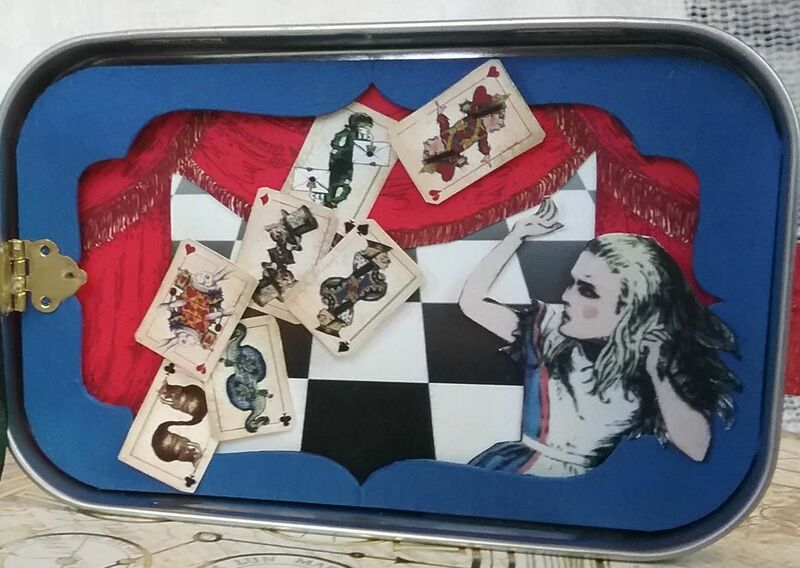 The inserts come in two style sets; one Alice in Wonderland themed and one with various scalloped edges. VIDEO TUTORIAL – There is now a YouTube video tutorial for this project. The video also covers 5 other altered tin projects. You’ll find the segment about this project at minute 22:18 in the video below. To create the pages for the book, I started by painting the frames. 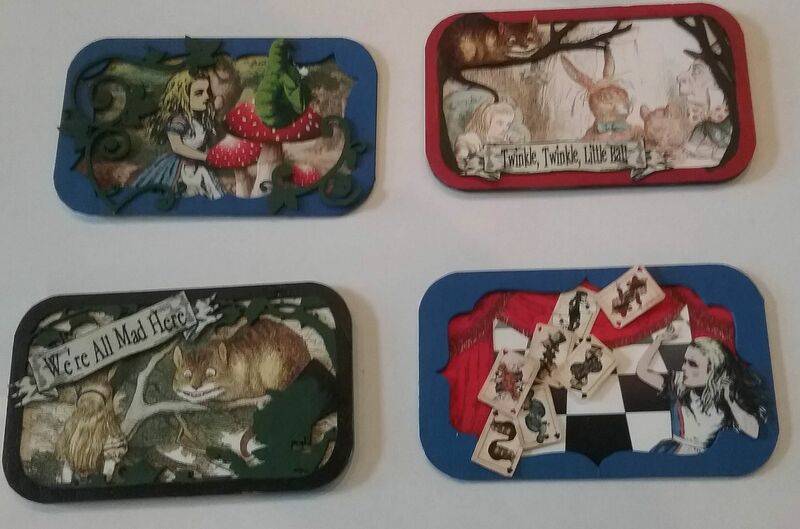 Next, I glued the frames to Alice in Wonderland illustrations. I also added some images to the front of the frames like the title banners and cards. You’ll notice that I didn’t use any dimensional embellishments on the pages as it would make the book too bulky and it wouldn’t fit inside the tins. Just stick with paper images and not too many of those. Decide which page you want as the first and which as the last and cover the backs of these pages with decorative paper. The end result is 6 unique pages. Below is the order and method in which I assembled the pages. Note that the photos I took were of the book sitting in the tin covers but as you assemble the pages they are not in the tin. 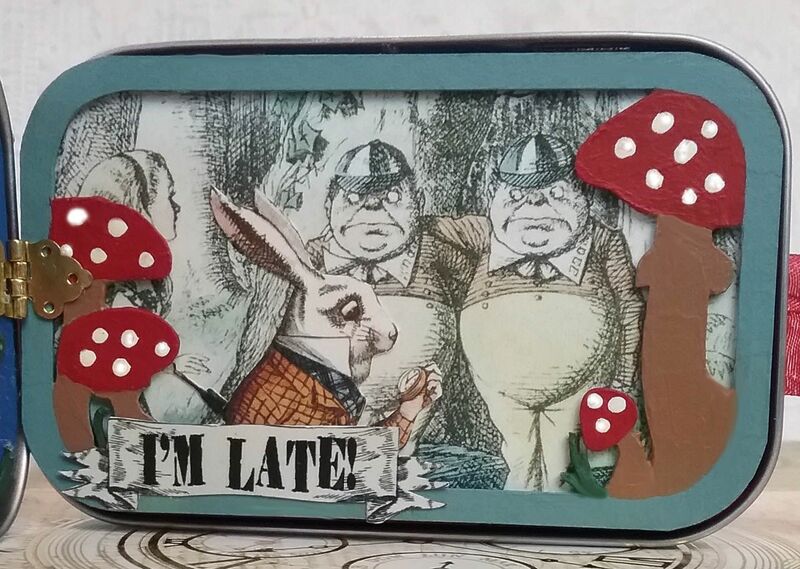 I glued a hinge to the Alice with Caterpillar page and then glued the other side of the hinge to the Tweedle Dee Tweedle Dum page. Since the Alice with Caterpillar page will be the first, the back side is covered with decorative paper. 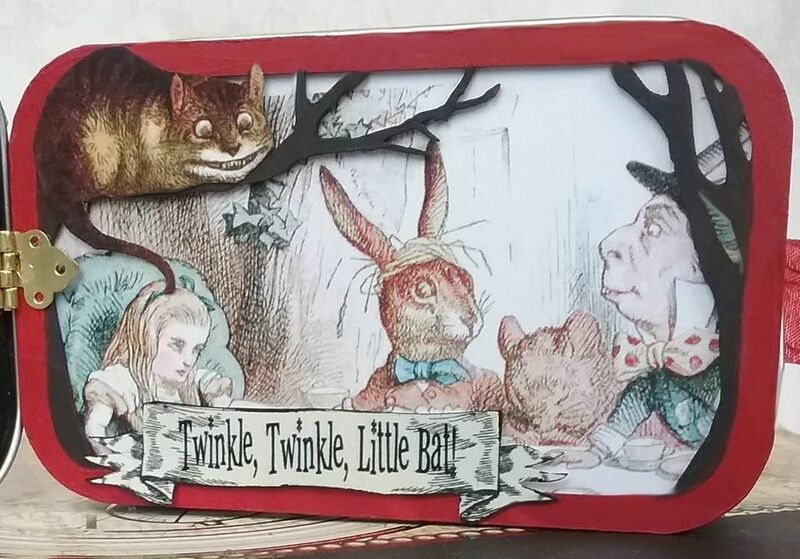 I glued the Alice and Cheshire cat page to the back of the Tweedle Dee Tweedle Dum page. 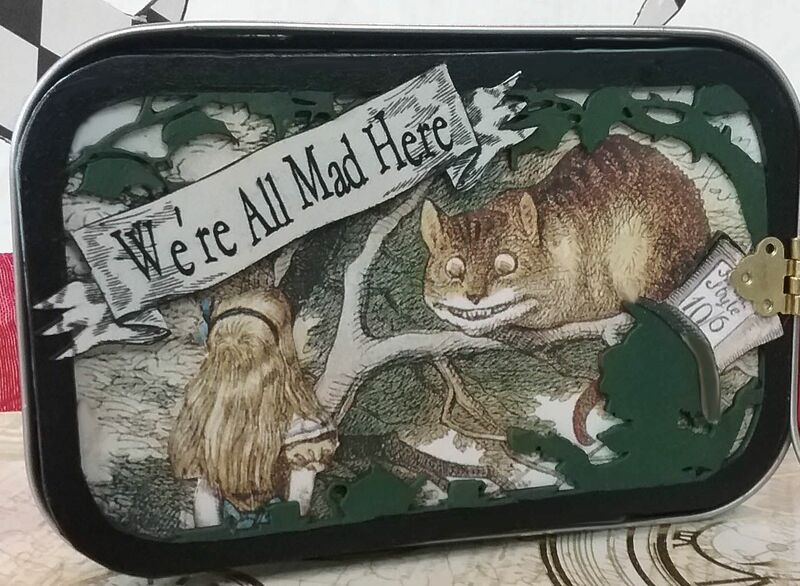 I glued a hinge to the Cheshire cat page. I then glued the other side of the hinge to the Tea Party page. I glued the Red Queen page to the back of the Tea Party page. I glued a hinge to the Red Queen page. I then glued the other side of the hinge to the Alice and Cards page. Since the Alice and Cards page is the last, the back is covered in decorative paper. 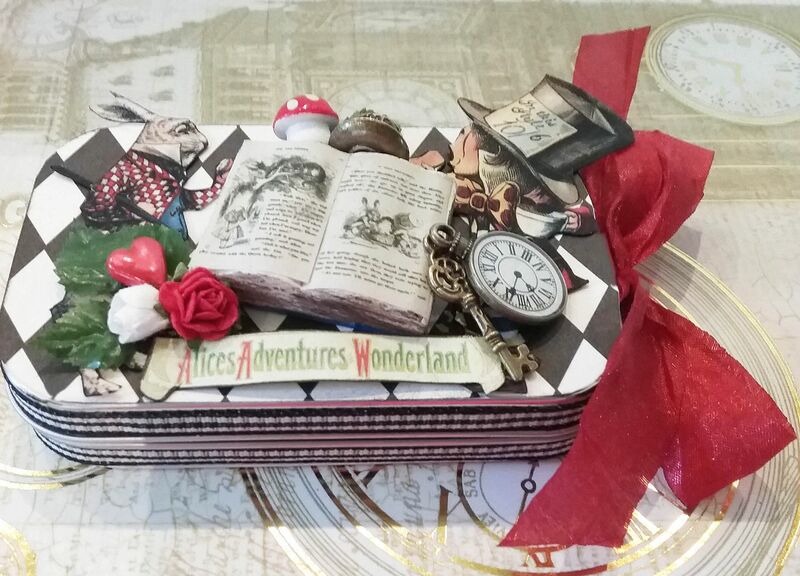 NOTE: Another option is rather than making a hinged set of pages that fit inside the tin covers, you could simply decorate the inside of each of the tins as if it were a shadowbox book. I started by wrapping the edges of the lids with decorative checkered ribbon from my stash. I ran the ribbon through my small Xyron machine to apply adhesive before attaching it to the lids. I used the Xyron machine as the adhesive won't seep through the ribbon as wet glue would. Note: After you pull the ribbon through the machine, rub the ribbon with your finger before removing it from the waxy paper dispensed from the machine. This will ensure that the adhesive sticks to the ribbon. 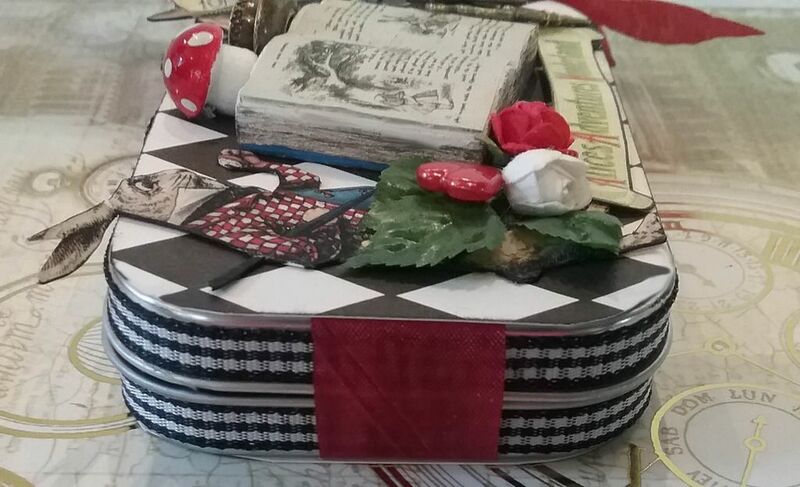 With the lids stacked together (insides facing each other), I used Glossy Accents to attach a ribbon. 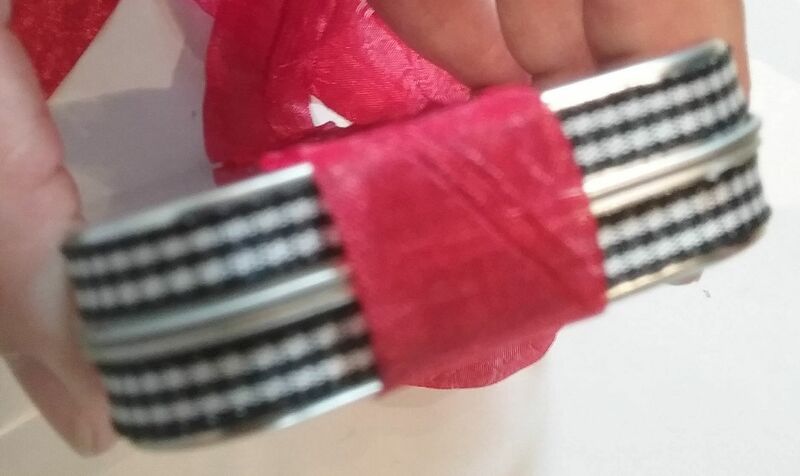 The ribbon needs to be long enough to go around both lids and to tie into a bow. I used Glossy Accent because it sticks to metal. In this case, it doesn’t matter if the glue seeps through the ribbon as it will be covered with paper. The last step is to cover the back of each lid with decorative paper. In the pictures below, you can see how the finished ribbon looks on the spine of the book and how the ribbon ties on the other side of the book. This is where you can go crazy with the dimensional embellishments. 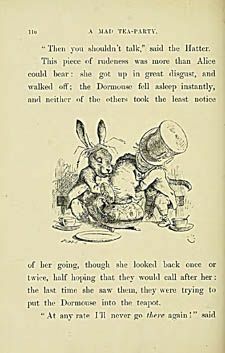 In the background, I used more images from the Alice collage sheets. 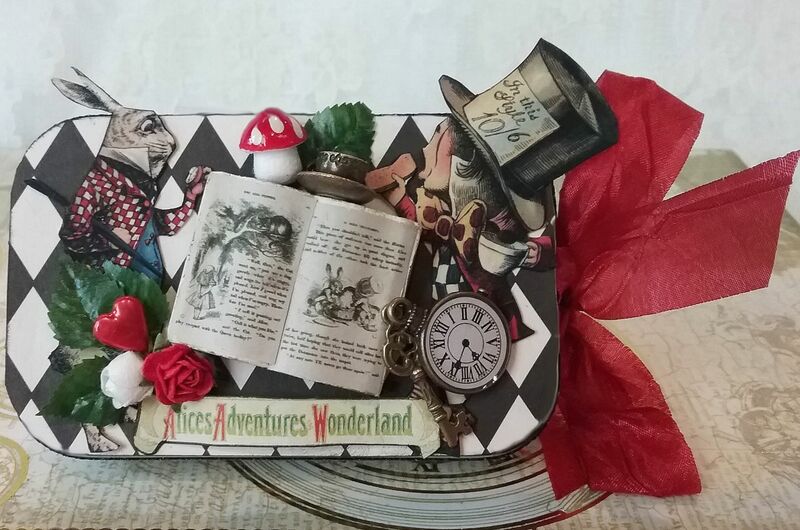 In the center is a miniature wood book that I painted and added pages of the Alice in Wonderland book. At the bottom of this post are the pages for your use. 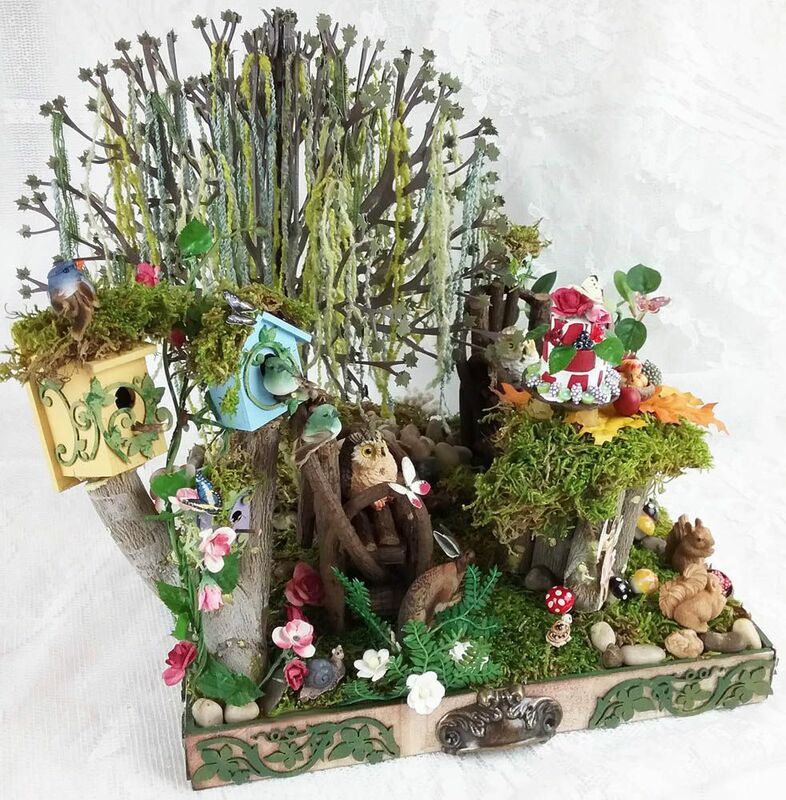 Surrounding the book are lots of bits and bobs such as a mushroom, teacup charm, clock, key, roses, and a heart stick pin. These are sized to fit the wooden book. Feel free to download and use them in your art. 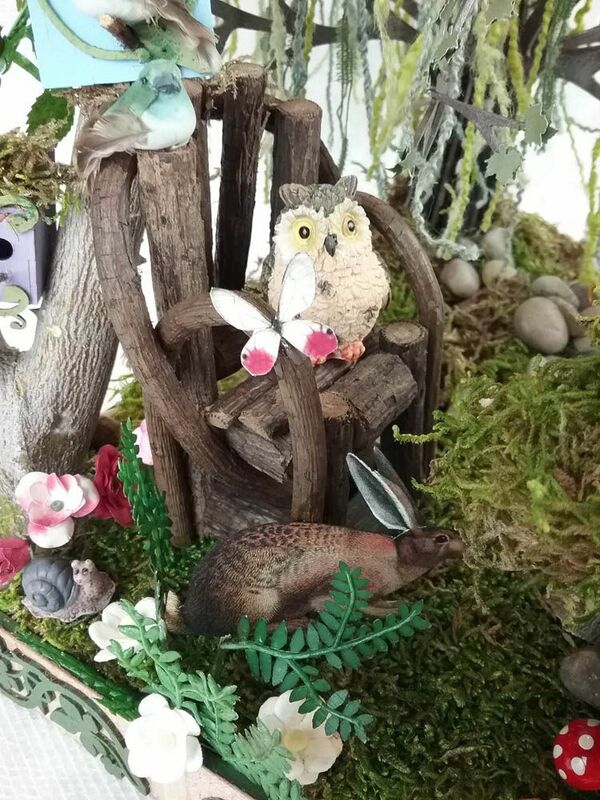 Deep in the forest under a moss draped tree, a tea party is set to begin. 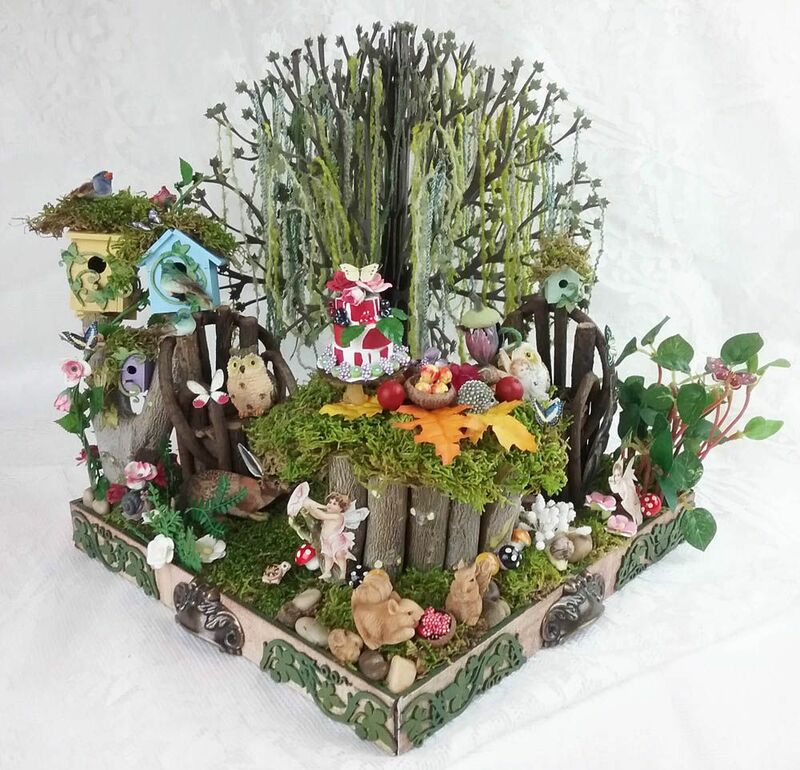 Looks like the fairies have created a sumptuous feast for the woodland creatures. I see the squirrels are already munching on a bowl of berries. The birds are enjoying the sun sitting on the roofs and ledges of their houses. 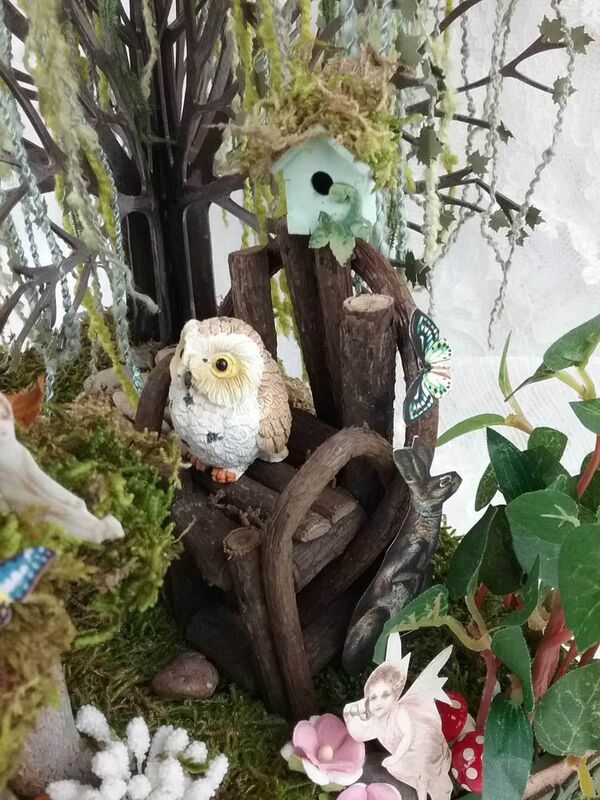 Vine chairs make comfortable seats for the owls. At the bottom you see a rabbit from the Into the Woods collage sheet. 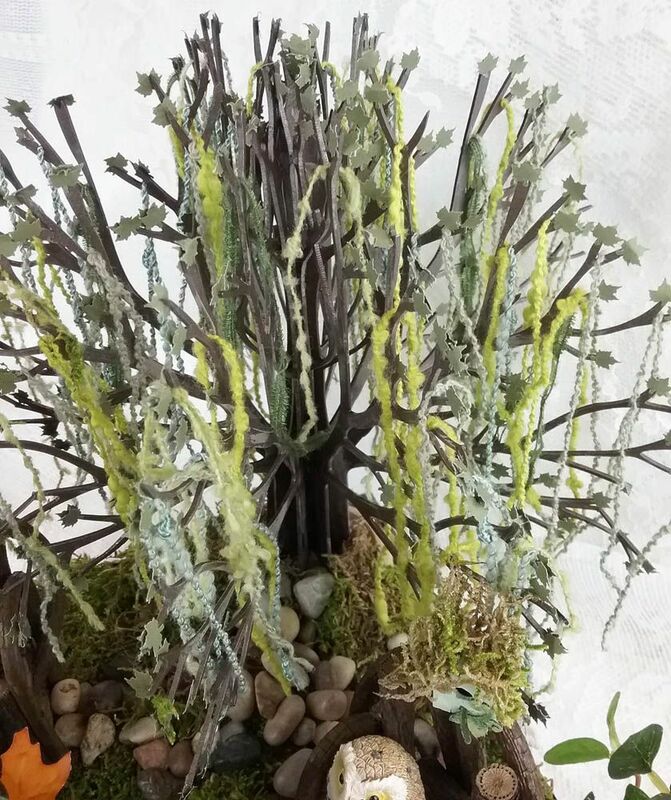 A 3-D tree made from a kit anchors the scene with fiber moss hanging from the branches. Even the smallest of creatures, a snail is joining in on the party. 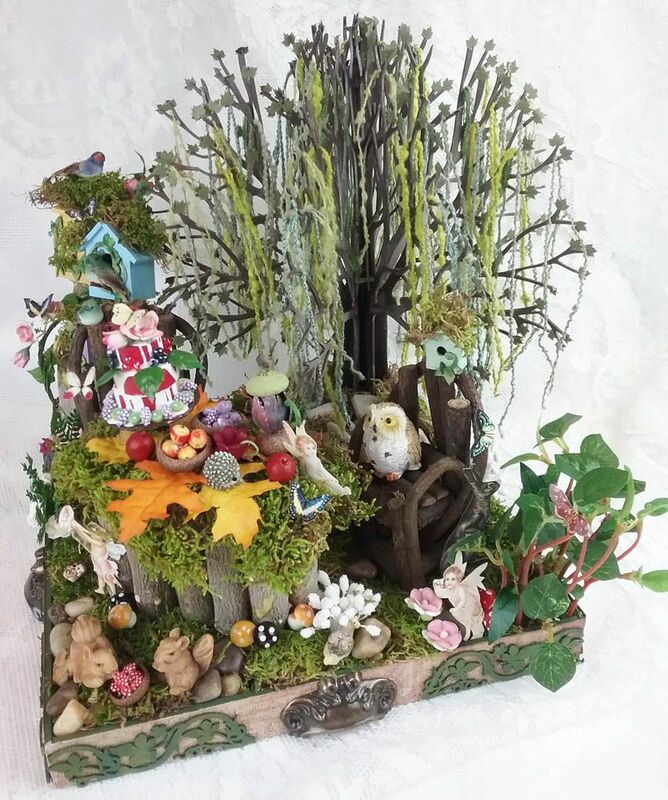 This happy scene is built into a box with handles that serve as a tray, making it easy to lift and reposition. 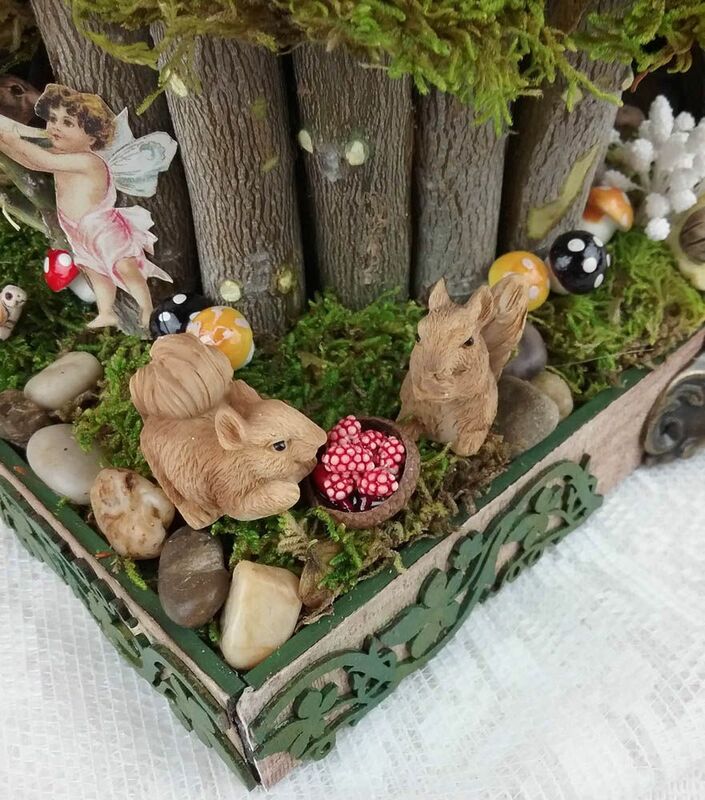 The base is made from an easy to assemble Cottage Base kit which I flipped to make a tray. 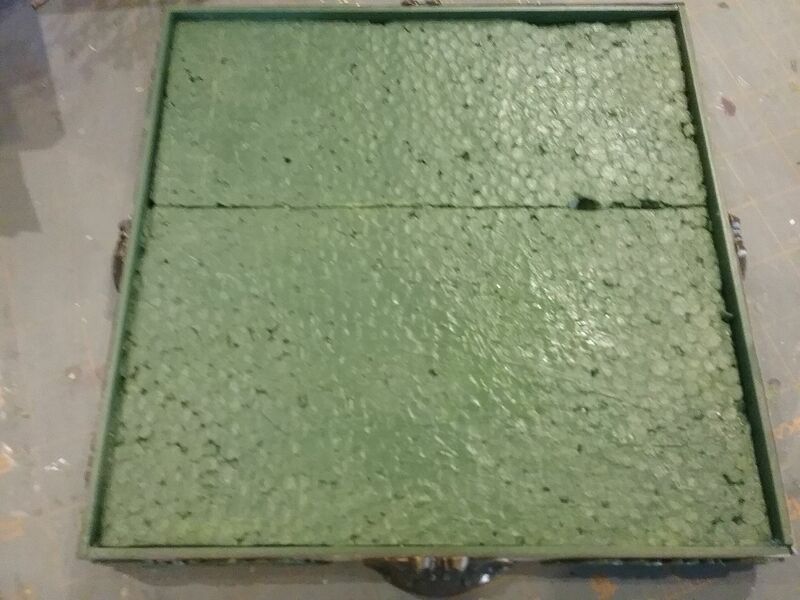 I started by painting the inside of the tray green (anywhere you think it my show) and papering the outside of the base. 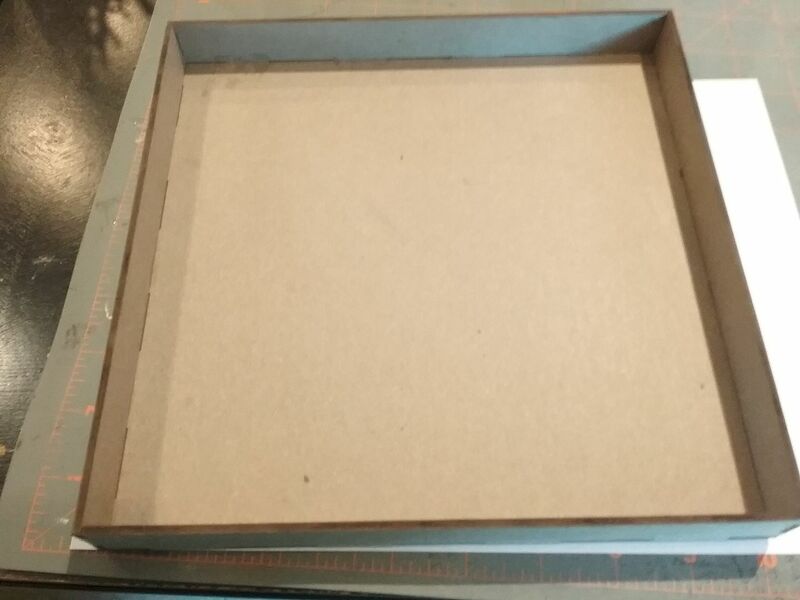 I then cut a pieces of Styrofoam to fit the inside of the tray. They are also painted green. The Styrofoam gives me something to insert the embellishments into. To jazz up the outside of the tray, I added pieces of chipboard ivy border painted two colors of green and door pulls to serve as handles. 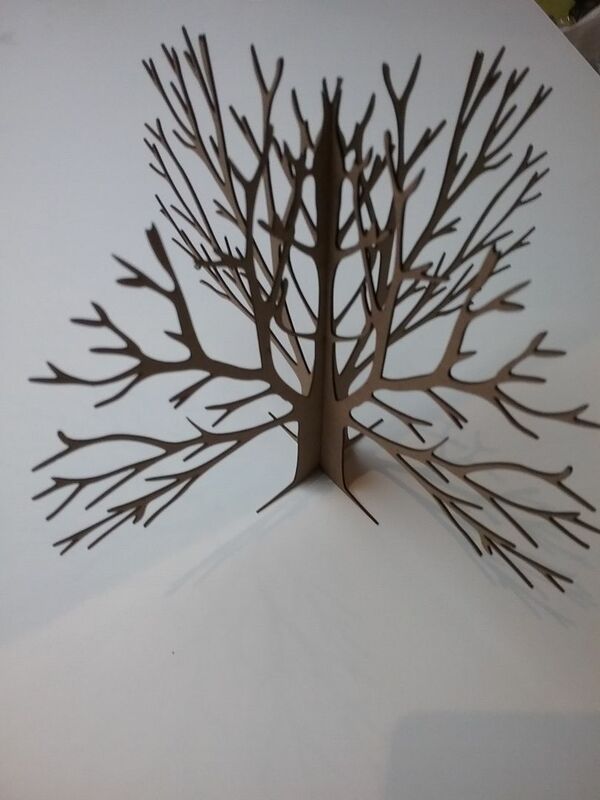 The 3D Tree kit consists of 2 pieces. The pieces slip one into the other. I added glue to the slits before combining the pieces and then wiped away the excess glue with a damp cloth. This kit comes in three sizes. I used the largest (8") for this project. The tree is one of my favorite parts of the project and a special request of mine to Alpha Stamps. I can see using this in many future projects. 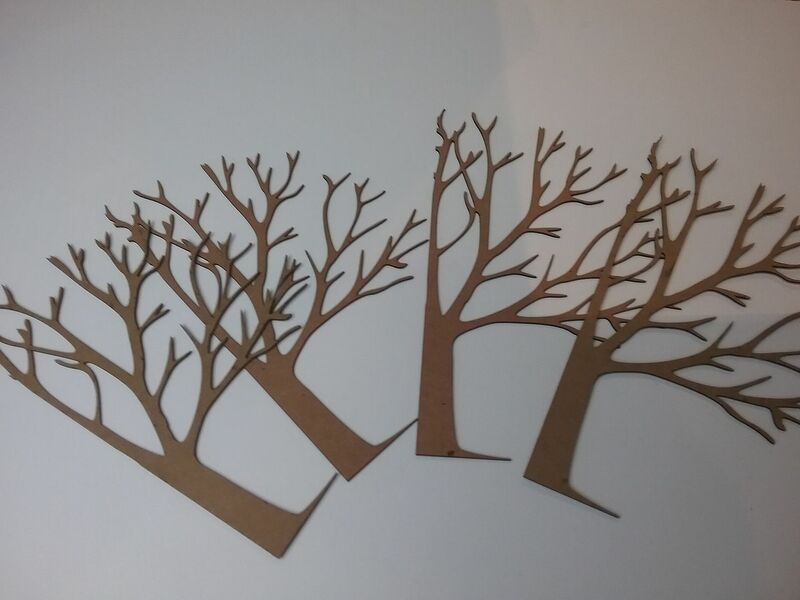 To add fullness to the tree I used a second kit in which I cut each of the pieces in half giving me 4 additional pieces. 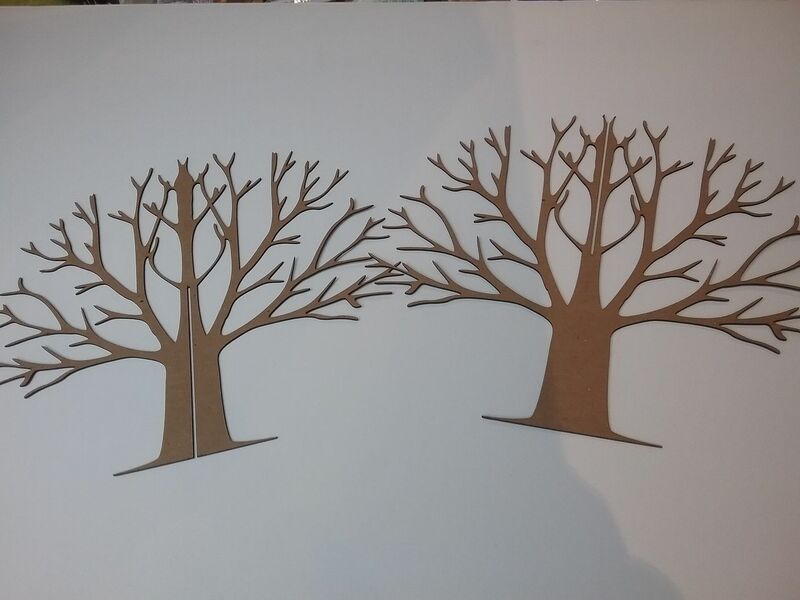 I glued the cut pieces into each intersection of the main tree which gives you a you a full looking tree. 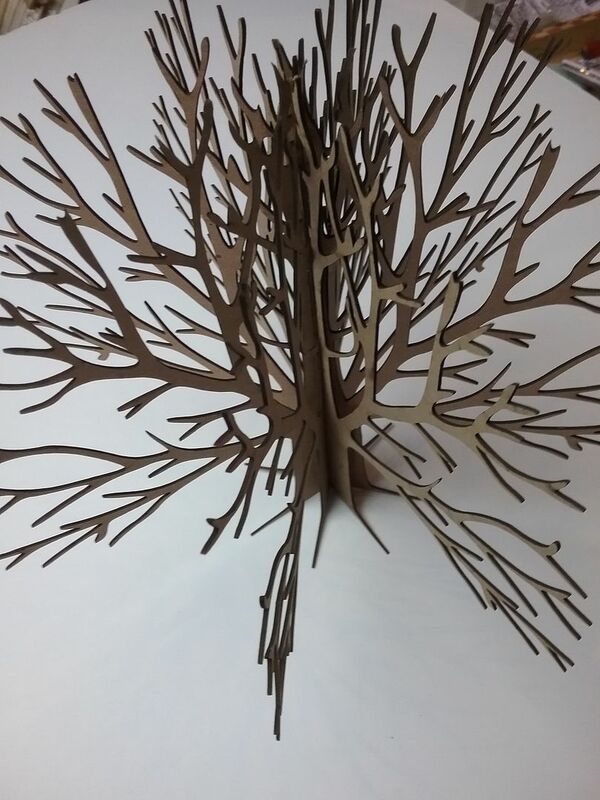 Then, I painted the tree two colors of green and attached the leaves which I punched from paper. 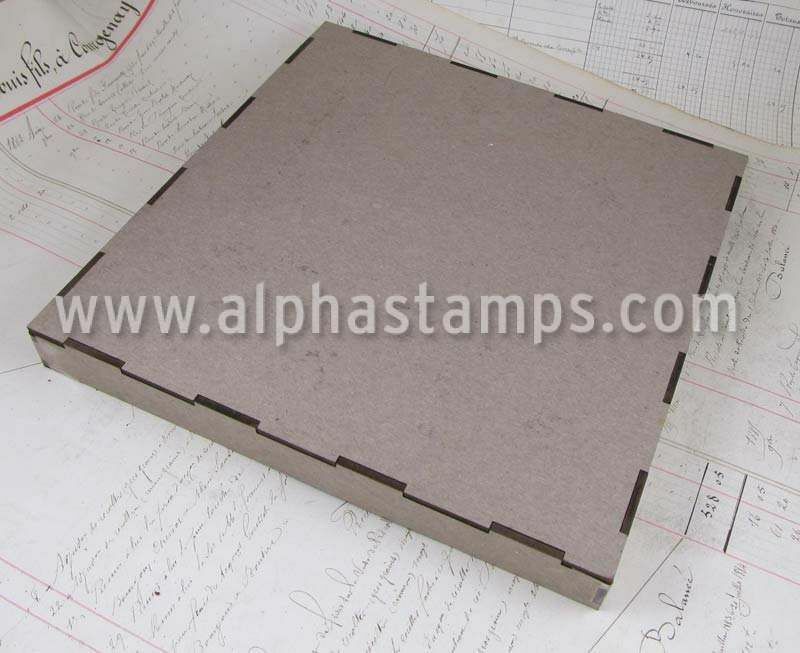 Alpha Stamps is carrying several different leaf punches. There is nothing special about the order of assembling first and then painting. You could choose to paint first and then assemble. If you are going for a winter or spooky look leave off the leaves. The last step was to drape various colored fibers over the branches. 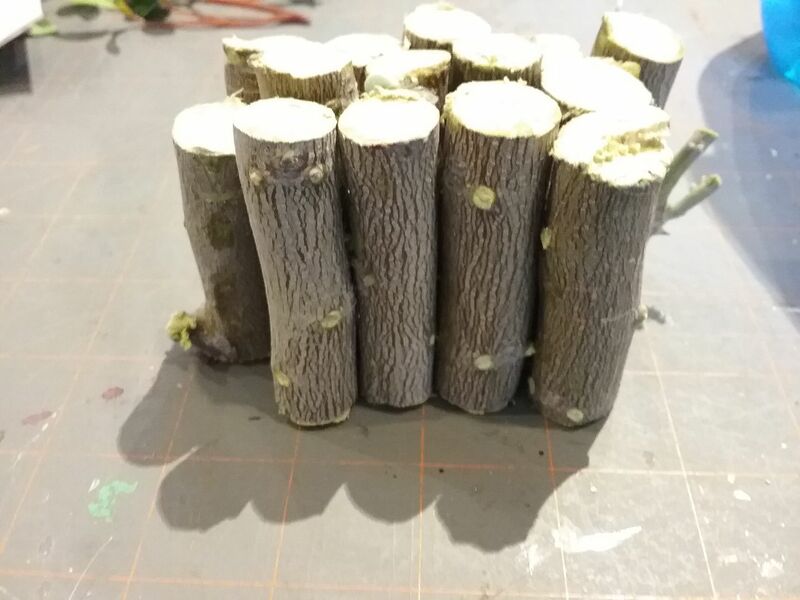 I soaked the fibers in water first to straighten them out, laid them flat to dry and then draped them over the branches. 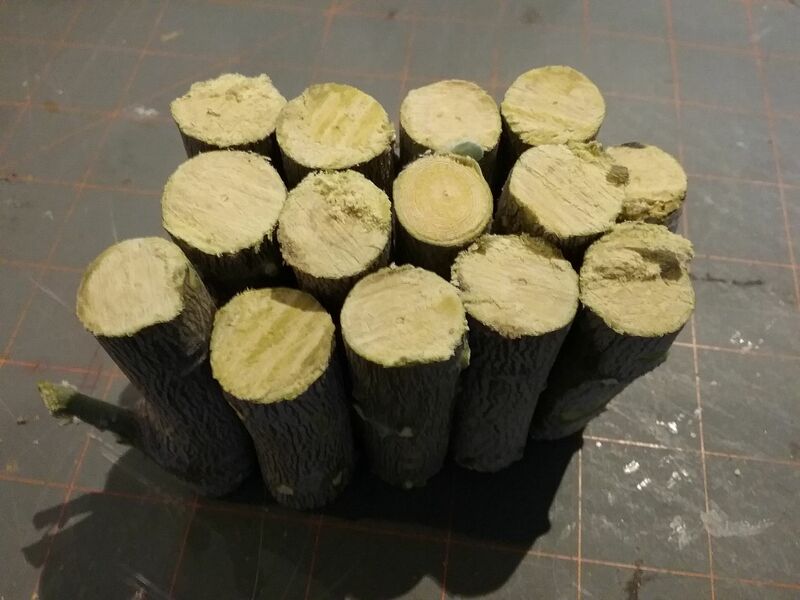 Before mounting the tree in the scene, I added wood blocks to the Styrofoam and then glued the tree to the blocks. This was to give the tree more height and make it look like it was on a small hill. The base of the tree and the wood is covered with the sheet moss and pebbles. The base of the table is made from branches cut from a tree in my yard. Of course I had to pick a tree with what seemed to be the hardest wood. It’s an Ironwood tree so I guess its name is accurate. The lengths of the pieces don’t have to be exact as I covered the top with sheet moss. On top of the table I added some fall oak leaves for contrast. The main item on the table is the scrumptious cake. 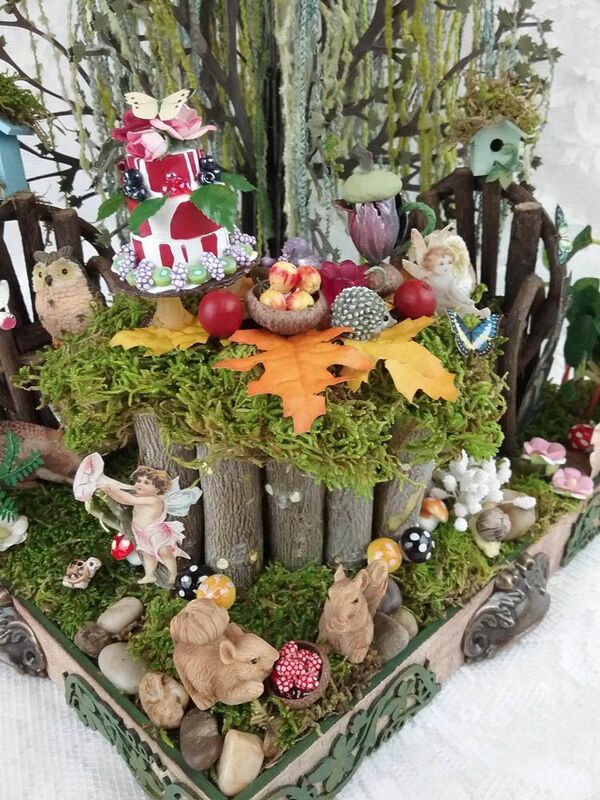 The layers of the cake are made from wood miniature cake kit. I used pieces from 2 of the kits. I painted the cake red and drizzled white paint over the cake to serve as icing. I cut out a larger circle of chipboard (painted brown) to serve as the plate. 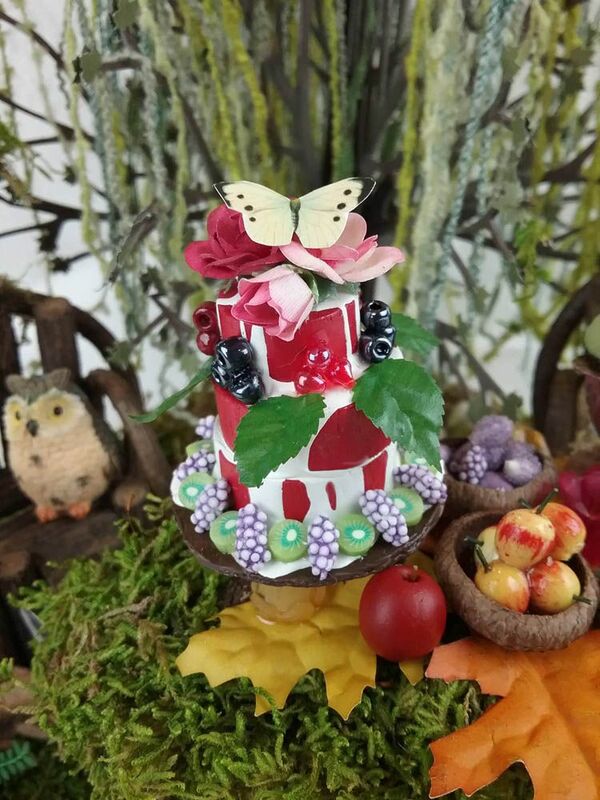 Around the edges of the cake are lavender berries, kiwis cut from polymer clay, beads serving as berries and leaves from the rose garland I used in other parts of the scene. 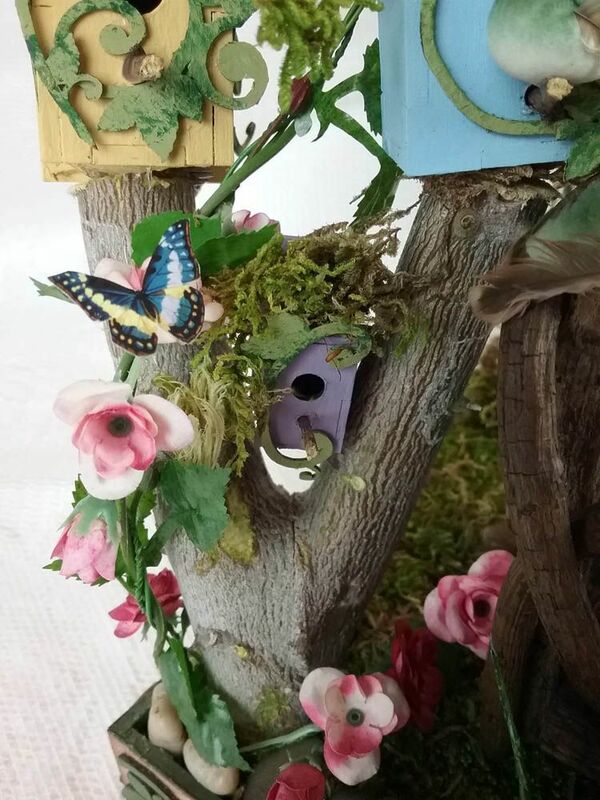 At the top are roses from the garland and a butterfly. 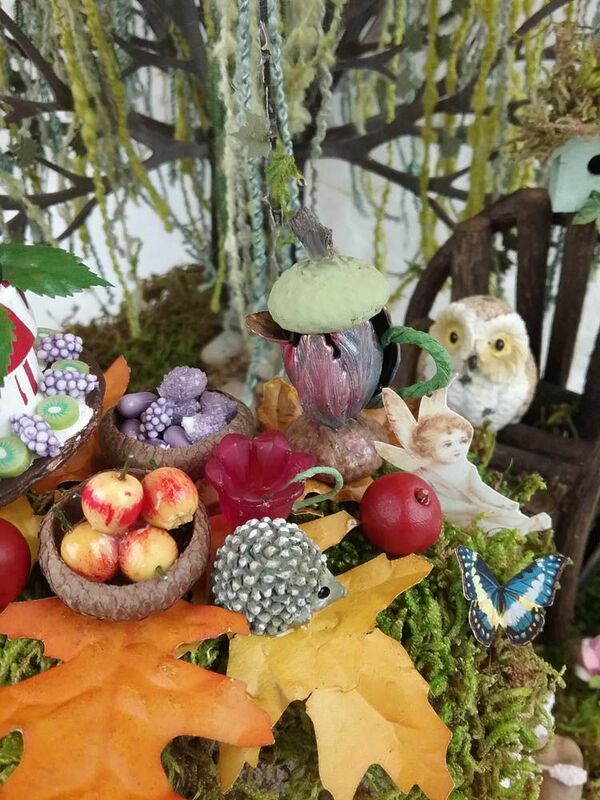 Berries and apples are sitting in bowls made from acorn caps. You can see a little hedgehog waiting to dig in. 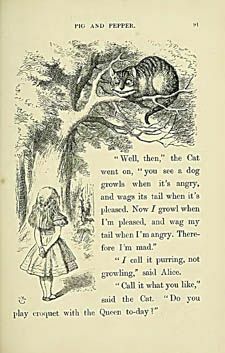 The teacup is made from a tulip bead. The handle is the stem cut from one of the mushrooms in the scene. The teapot is made from a tulip bead cap with acorn caps as the base and top. The handle is made from three stems twisted together. 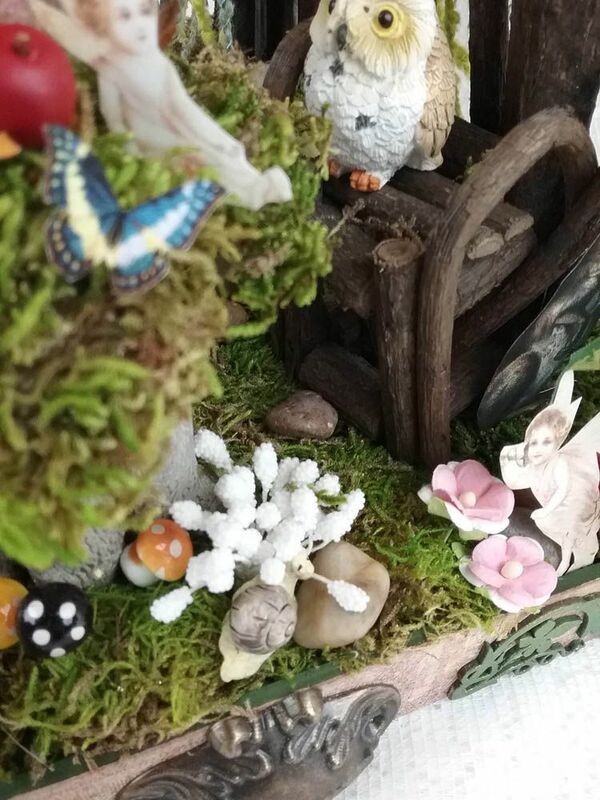 On the table sits a fairy from the Vintage Postcards Fairies collage sheet which is the source of all of the fairies in the piece. 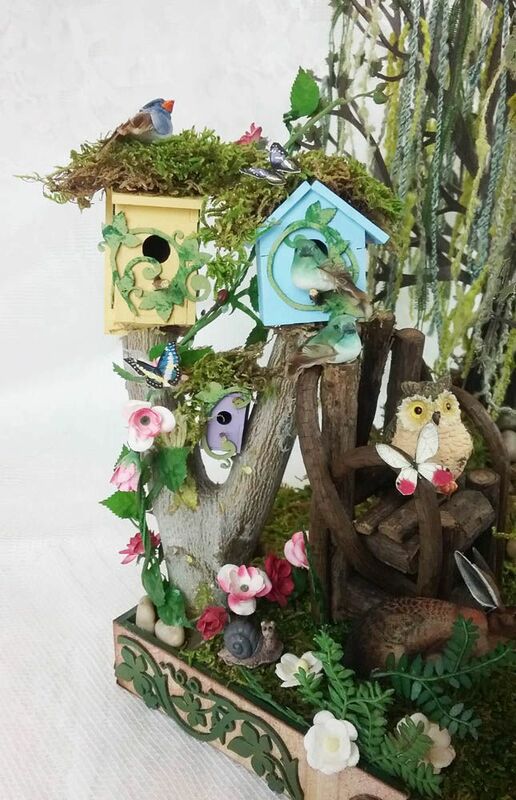 The bird houses are from chipboard kits that are easy to assemble. 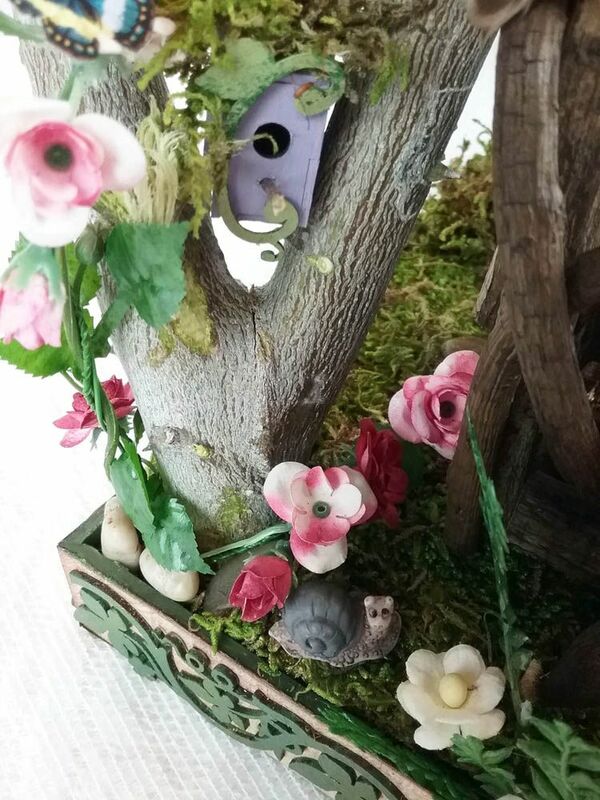 I assembled them first, added the paint, moss on the roofs and leafy chipboard pieces as decoration. Small twigs from my yard served as ledges. The wood the houses sit on is again from the Ironwood tree.